Adult Dosage: Recommended dosage will vary depending on the country. However, studies show that to get the best results, your blood levels of Vit D need to be optimal(ie more towards the top of the normal range.) It seems as every few years passes, medical labs are raising the upper end of the normal range higher and higher! In Canada, 1,000 IU’s a day is the current recommended dose. Many doctors are realizing that this is usually not near enough. Another note: the darker the skin, the higher the dose required to get the optimal benefit due to increased melanin production in the skin. 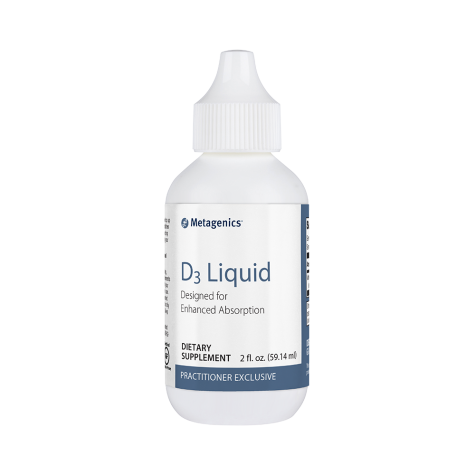 Featuring 1000 IU per drop of vitamin D3—the most bioactive form of supplemental vitamin D—in a convenient, 2-ounce bottle for easy dosing. Delivers vitamin D3 solubilized in oil to support absorption in the intestinal tract, and features a pleasant, natural mint flavor for improved patient compliance. “Vit D3 is not actually a vitamin – it is a pro-hormone! As such, it is valuable in the body as it synchronizes and harmonizes the other hormones. With all the many other benefits, Vit D is the most inexpensive form of health insurance money can buy!” David Sloan, PhD, NNCP, RNT, Clinic Director – Sloan Natural Health Center.